I am here to free the preserved lemon from the grip of Morocco. If you have heard of preserved lemons at all, you are probably conjuring images of exotic spices, tagines, cinnamon and lamb. This was definitely true for me until recently. When I looked for a method, all I found initially was version after version of Moroccan-style preserved lemons. Then I dug deeper. I now know that there are scores of methods of pickling or preserving citrus. Wherever they are grown, they are preserved. Even in America. Anyone remember all those pickled limes appearing in Little Women? Those were Florida key limes shipped up north by the barrel. A lot of 19th century recipes involve horseradish, mustard seed, ginger and mace. Cloves made appearances, as does nutmeg and ginger. Vinegar is a commonplace. Methods vary wildly. “Mrs. Bradley’s Housekeeper’s Guide” (1860) would have you salt down the quartered lemons, then sun dry them for days until leathery. Then pack into jars with ginger and vinegar and wait a t least 6 months. “They are best after a year old,” she says. And these are just the Western methods. In Sri Lanka, they boil lemons until they split, then stuff the split part with salt and submerge the fruits in vinegar. Six months later, they are minced with shallot and chiles and served as a sort of gremolata with rice or curry. Russians do something similar. They simply submerge their lemons in brine and wait. After a few months, they slice them thin and serve as a side dish with wild game. Cambodians also preserve their lemons whole. The Greeks began by preserving citrons, then added lemons to their repertoire in the 1st century; if you’re Greek, one of the few good things about the Persians was that they brought the lemon to Greece. Their method for preserved lemons is simple: Quarter the fruits, salt, and cover in lemon juice. In India, they chop the lemons and make a sort of sweet-spicy relish out of them. Chinese make preserved lemons, too, as do East Africans — in fact, the great Ibn Battuta reports eating preserved lemons in Somalia as early as 1325. Maybe Battuta, a Moroccan, brought the recipe back with him? But why make preserved lemons at all? What’s the point, when you can find fresh ones at the supermarket all year? The obvious answer is that before supermarkets, lemons, like other fruit, were a seasonal specialty. For me, I can’t get lemons from my yard after April or before November. I must buy them. Or tap my stash of preserved lemons that sits quietly in my pantry. Preserved lemons are to fresh ones what cured salami is to fresh meat. No they are not fresh, but they are just as good, if not better. It is a different taste and sensation. Funkier, more mellow. Yet a preserved lemon is still a very powerful thing. Intensely salty and acidic, a little bit goes a long way. I only use the rind. Some use the inner portion of the lemon, but I find the rind to be good enough — it has all the oils and the color, and once you strip off the white pith there is no bitterness. General rule of thumb is that preserved lemons work well wherever fresh ones do — with fish, white meats such as chicken, pheasant and rabbit, and even with red meats in certain places: A preserved lemon gremolata on a simple seared venison medallion adds an unusual touch. Now is the time to grab a slew of mason jars and put some lemons up. How many? Keeping in mind this is a specialty pickle, I’d start with two or three quarts of the standard-style pickles. But you might also want to pickle some whole like the Russians, and the sweet-sour-spicy Indian lemon relish is always a hit. See which method best suits your taste, and go heavy on that one next year — or, if you have a tree like we do, you can do a late batch again in early spring. The best time to preserve lemons here in California is the dead of winter, but before any big freezes. December-January is best. It could be different where you live. If you are buying your lemons, season doesn’t really matter as lemons are available from somewhere all year long. Different lemons will produce different results. Meyer lemons are sweeter, a little less acidic and more orange in color than the standard Eureka lemons. You also can preserve limes in exactly the same way. If you are buying lemons from a supermarket, you will need to scrub them with a brush first; no soap. You want to remove any residue or wax from the rind. If you are using your own lemons or those from the farmer’s market, you still need to wash and dry them to remove dirt from the surface. The basic ingredients for preserving lemons are: the fruit, water and salt. Everything beyond that is optional. Keep in mind there are dozens of ways to pickle lemons, and I am providing only three methods here: A Russian one, an Indian one and a more universal method employed by both the North Africans and early Americans and English. I’ll start with the Russian method. This is the whole lemon method. 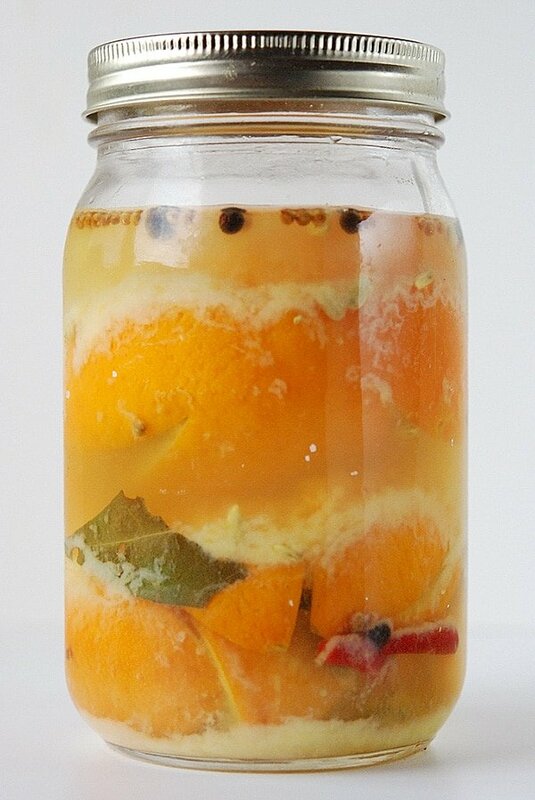 Simply submerge the washed and dried lemons in a brine. The strength of the brine should be 1 tablespoon of pickling salt — it must be pickling salt, which is available at most supermarkets — per cup of water. Wait at least three weeks and slice thinly to eat. The Russians eat this as an accompaniment to wild game. 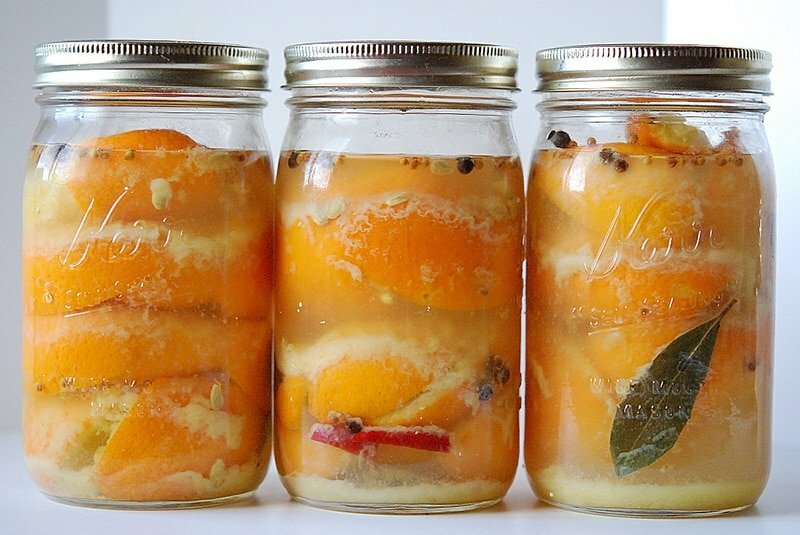 This is the method most people use for preserving lemons. I’ve found references to it dating back to a British cookbook from 1808, although now most people associate it with Moroccan cooking. Slice the washed and dried lemons lengthwise, almost in quarters. You want the lemon to still be in one piece, but almost cut through. If you are using Eurekas, which often have little nubs on the ends, cut them off before you almost-quarter the lemons. Using Kosher, pickling or pure sea salt, stuff the lemon. Pack it in well, and use about a tablespoon per lemon. Mush the lemon into a clean Mason jar; use quart jars. Repeat until you have the jar mostly full. Toss a little more salt on top. Now you have several decisions to make. You can jam in some spices — I suggest a cinnamon stick, some peppercorns, a couple cloves and a bay leaf. And you can choose to cover the lemons with vinegar or lemon juice, or not. Some people just keep mushing the lemons down until their own juice covers them. The early British and Americans covered the lemons with vinegar. I cover them with lemon juice. Seal the jars in a hot water bath (water at a simmer) for 10 minutes. This is not totally necessary, but I do it to be safe. Wait at least 3 weeks before eating. I’ve kept these lemons for two years in the fridge and they were fine. They will darken over time.
. It’s also sweet-sour from sugar, and spicy from cumin and chile peppers. First slice the lemons into eighths — again without cutting all the way through, like the Moroccan method. Get together the following: 1 part fennel seeds, 1 part cumin seeds, 1 part black peppercorns and 1 part pickling salt. Think a teaspoon of each per 3 lemons. In a dry pan, toast the fennel and cumin seeds over medium heat until they are fragrant. Grind all the spices together and stuff into the lemons. Jam the lemons into a quart jar and cover with extra lemon juice. Cover and let sit at room temperature for a week. When the week is up, pour out all the juices into a non-reactive pan. Squeeze the lemons gently to release more liquid and put that in the pan. Bring the liquid to a simmer, adding sugar to taste. You want it sweet-sour. Once the sugar has dissolved, add 1 to 4 small hot chiles; depends how hot you want it. Put the lemons back in the liquid and simmer gently for 10 minutes. Using tongs, remove the lemons and put them back in the jar. Cover with the liquid and seal. Wait a month before eating. Beside confit for lemons, recently came across a recipe which call for preserving lemons in a jar after slicing the lemons and having drenched them in suggar . The lady suggesting keeping in refrigetator a couple months. Does any one know about this process and what would be the length of time to keep it in the refrigerator. I have bought and eaten from a roadside stand in Baja (I know but I was with a local) limes and lemons preserved in a sweet syrup. The combination of sweet and sour was amazing. I cannot find any information on how to make these. HI , While living in France years ago, I did the salted method, rinsed, and packed in EVO, air tight. Weeks, months later, delicious. I even packed some with dried chili and anchovy. What a flavor bomb. This coudn’t have come at a better time! My neighbor just gave me a huge bag of lemons from their tree and I was trying to figure out what to do with all of them. Love it!